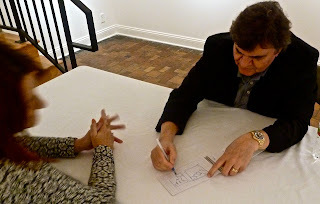 That’s basically the speech I made in 2008 during the opening of George Rodrigue’s retrospective exhibition at the New Orleans Museum of Art. 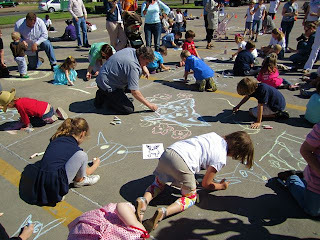 I thought at the time that nothing could top the experience of nearly three hundred works and sixty thousand visitors in our beloved NOMA, a fine arts institution for the southeast, celebrating its 100th birthday this year. However, there are other milestones if not more important, than just as, such as this year’s tour, broadening the boundaries of George’s backyard outside of New Orleans to include the state he loves, Louisiana. 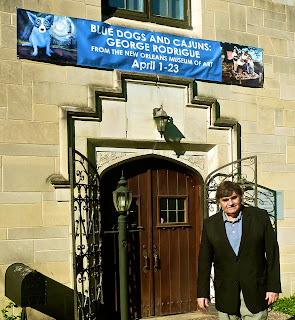 The painting Blue Dogs and Cajuns on the River (2011, 48x72 inches) celebrates a section of this state-wide tour, a major museum event in 2011, a blockbuster show at the Louisiana State University Museum of Art located in the Shaw Center for the Arts in Baton Rouge. I asked George about the painting. 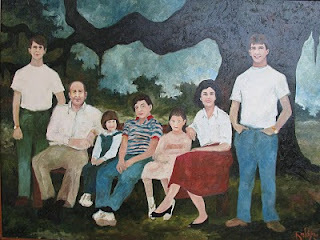 “Unlike the black bayous and dark trees of my early Cajun paintings, I use color here to reflect a modern Louisiana. 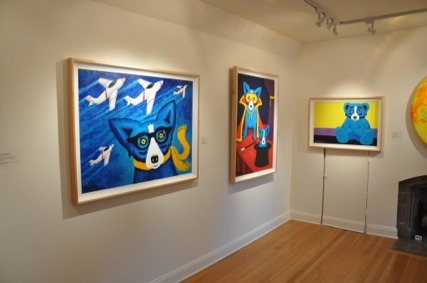 In the art world, the use of color, especially flat, bright color, is modern, in the Pop Art vein. 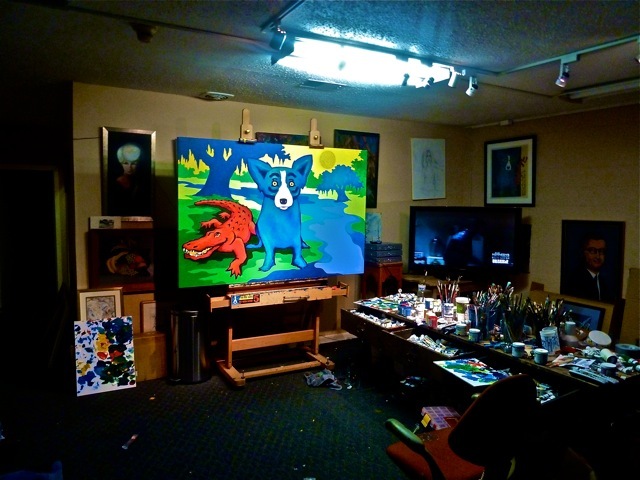 I contrast those colors with the dog, the only thing that is blended and painterly, making both the dog and overall composition more important. 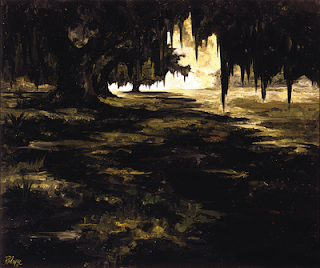 On view currently and briefly at the new Rodrigue Gallery in the French Quarter, this painting is a highlight in the Baton Rouge exhibition, July 24th to September 18th, joining sixty Rodrigue paintings spanning more than forty years of the artist’s career. 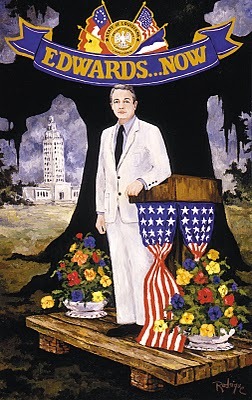 In addition, the Baton Rouge show includes a collection unique to this state capitol venue: Rodrigue’s five governor’s portraits, Huey Long, Earl Long, Edwin Edwards (above), Kathleen Blanco and Bobby Jindal, hang together for the first time. 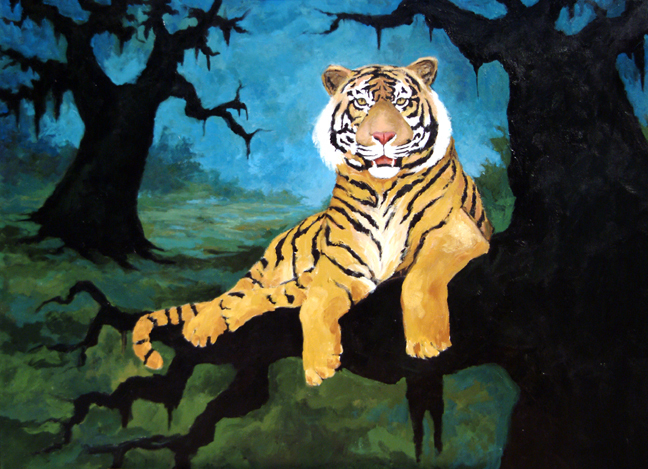 Also on view are Rodrigue’s portraits of Presidents Ronald Reagan and Bill Clinton, a selection from his series called Hurricanes, the first Blue Dog painting, and the original painting of Mike the Tiger, prints of which raised more than $1 million in 2003 to help build the LSU mascot a new habitat. From the way he talks about it, I know that George is most excited about seeing his Governor’s portraits as a collection. For me, however, a real highlight of a show like this is its focus on his earliest landscapes, most borrowed from his personal archives, as though he discovers the soulful and unique beauty of his home state through applying paint to his canvas. It is within a Rodrigue landscape, whether a near-black painting from 1970, perhaps including a glowing Cajun figure, or within the bright colors of 2011, perhaps including a Blue Dog and Red Alligator, that George’s devotion to his state is most evident. 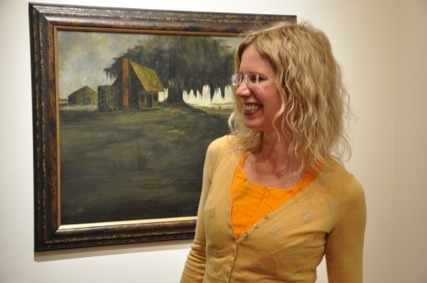 “The river in this painting represents our cultural history. 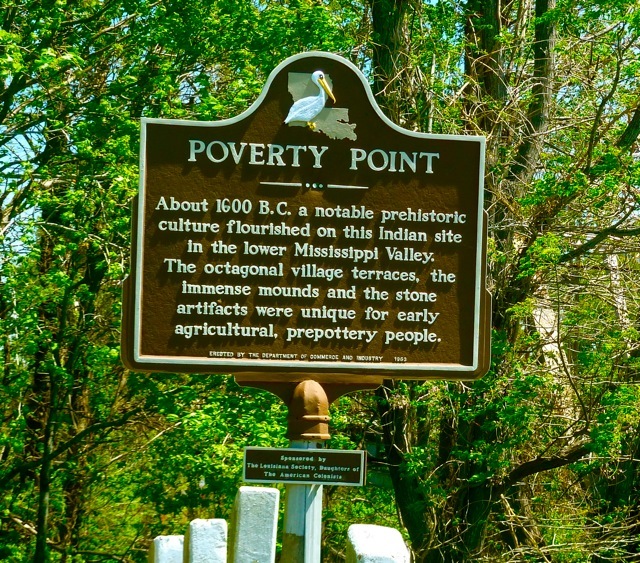 The waterways of Louisiana were the early highways of its inhabitants. We had no roads; we just had the water. They were the natural fairways for commerce, development, and everything necessary for settlers to expand. 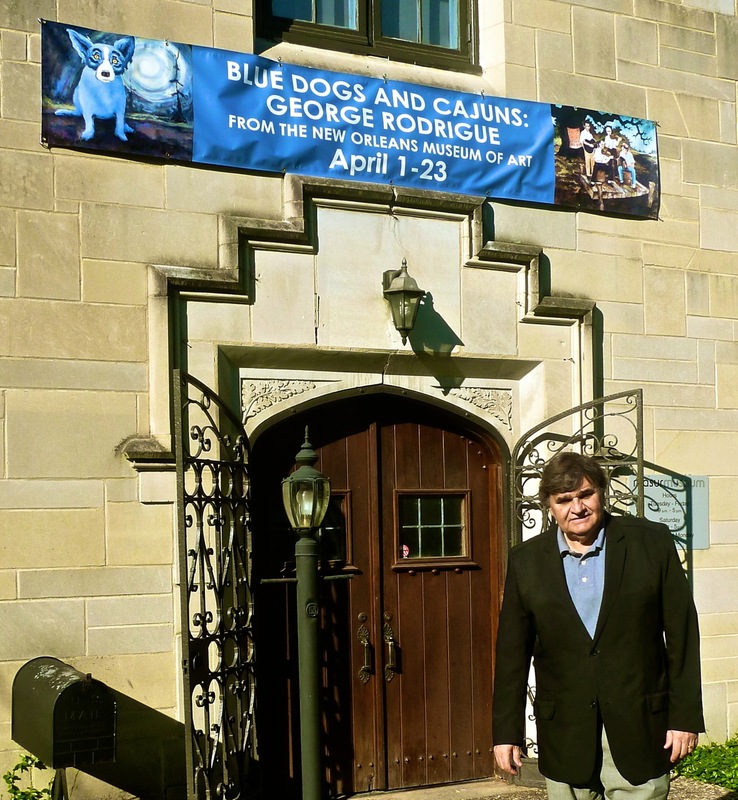 The exhibition in Baton Rouge and other Louisiana venues celebrates our state through the paintings of George Rodrigue. 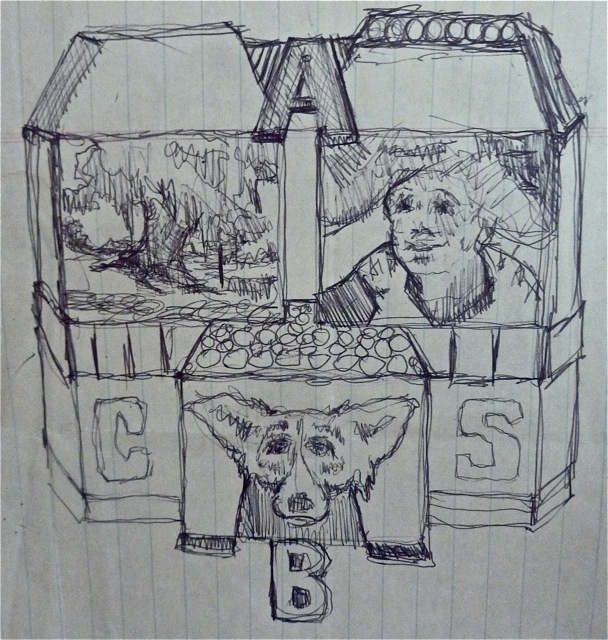 When I made this comment to George, he laughed at the irony, recalling the collectors of his Cajun paintings. 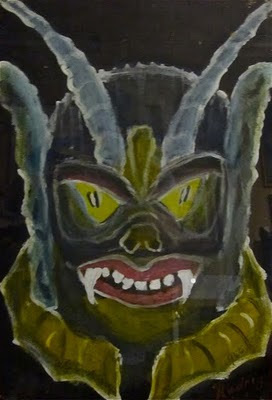 Only a handful of people from Louisiana own his original work. 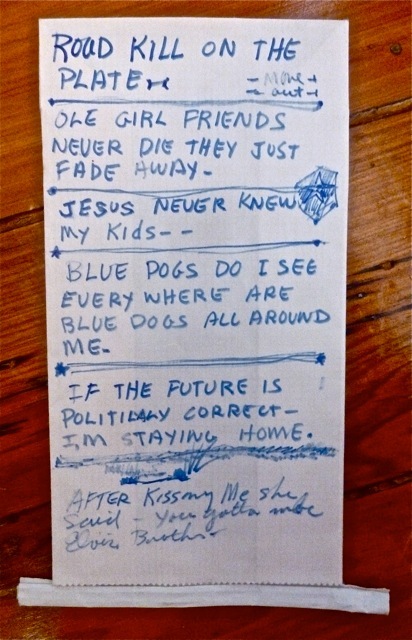 With the universally appealing Blue Dog, this is understandable. But what of the Oak Trees and the Cajuns? 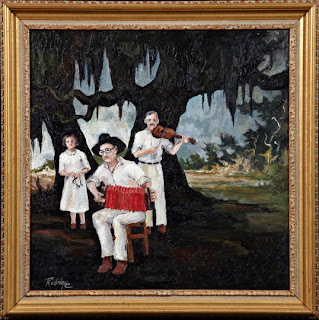 However, the Cajun music subjects remain his favorites, returning again and again to his canvas like painterly records of a once isolated culture. 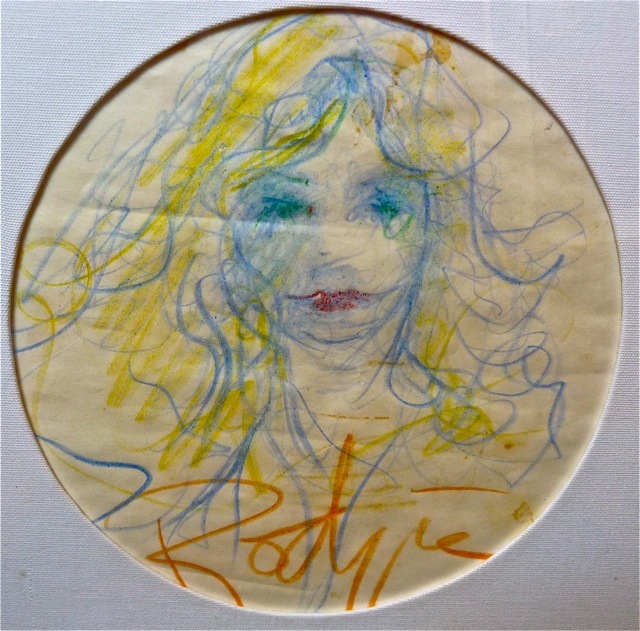 It was 1971, the year of George’s first painting with people (The Aioli Dinner), that he painted accordion player Iry LeJeune. 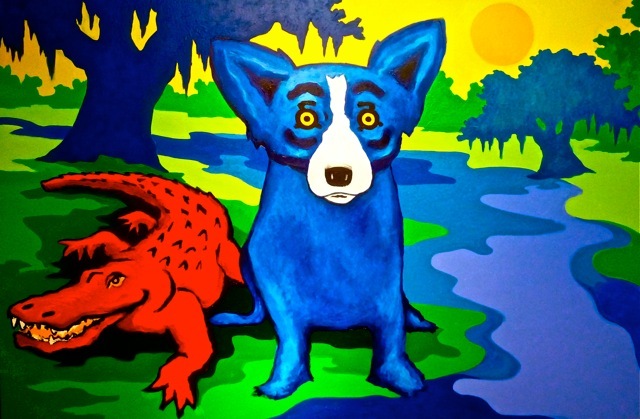 This early work shows a twenty-seven year old Rodrigue already confident in his graphic symbolism, as he seeks to preserve the Cajun culture on his canvas. 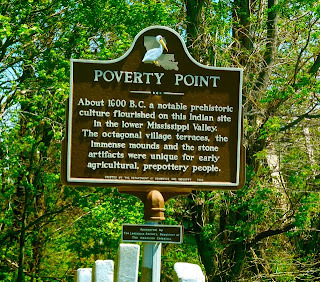 The figures, spirit-like, all in white, are shapes set against the Louisiana landscape, the land that produced an ardent people devoted to their culture, veritable symbols of themselves, long before the American Cajun craze and stereotype. Born near Church Point, Louisiana to a farming family, Iry LeJeune (1928-1955), near blind from birth, turned to music as a young child. 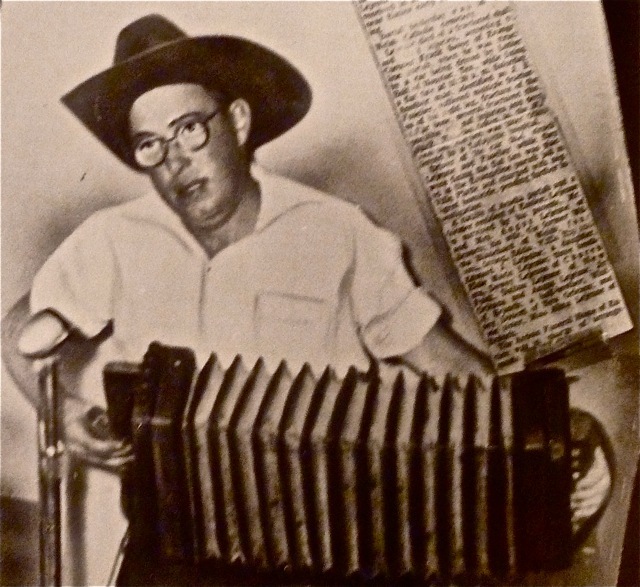 It was his cousin, Angeles LeJeune, who first introduced him to the accordion. But it was the records of Amedee Ardoin that most inspired him, influencing both his Cajun-French style and his recording future. Known for his soulful music, many consider LeJeune to be the greatest Cajun accordion player and recording artist of all time. 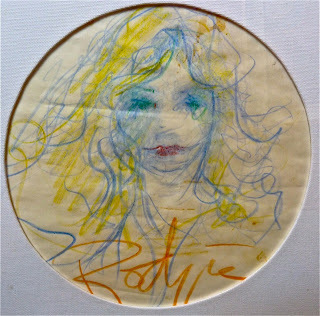 Produced by Eddie Shuler and Folk-Star, a subsidiary of Goldband Records out of Lake Charles, Louisiana, Iry’s recordings of "Calcasieu Waltz," "Jolie Catin," "Evangeline Special," and many more were big hits. 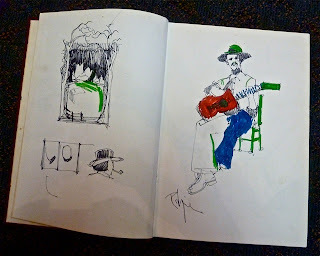 Despite the musician's near blindness and impoverished means, he became a legend in his twenties, much like his Alabama contemporary, country music star Hank Williams (1923-1953, the subject of next week’s post). Shuler claims to have first met LeJeune as he walked down a dusty road, carrying his accordion in a flour sack. It was the first accordion the music producer had ever seen. In 1949 Shuler produced a 78-rpm record, LeJeune’s "The Calcasieu Waltz." 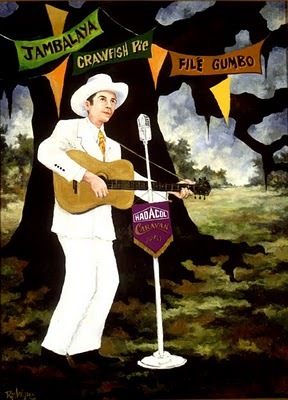 The men made seventy dollars on the record, and a Cajun legend was born. To meet you, pretty heart. Hey-aie, the promise you made me! -Iry LeJenue, "The Evangeline Special," 1948; Listen here. On May 12, 2011 the Boy Scouts of America honor George Rodrigue with their highest honor, the Distinguished Eagle Award. Since established by the National Eagle Scout Association in 1969, only six Eagle Scouts from the New Orleans area have received this honor, the last one twenty-two years ago in 1989. "It gave me a chance to meet professionals in various fields, because they had to sign off on my badges. I spent hours with firefighters, police officers, and even the local funeral home director. 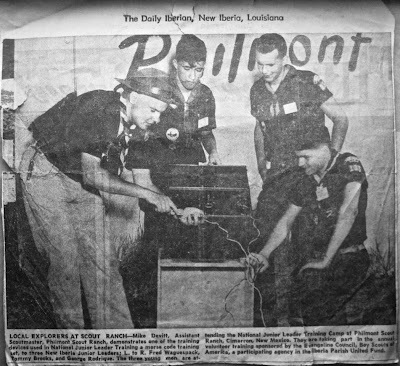 One expert was a published historian who asked me, 'Do you know where the name New Iberia comes from?' I had never thought about the Spanish heritage of my hometown. 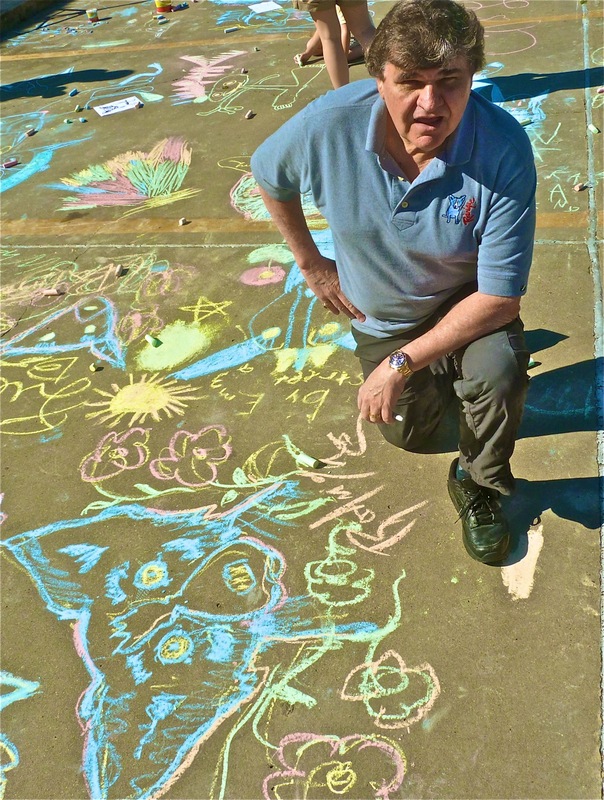 I retained more about local history in that one afternoon than in twelve years of study at Catholic High." 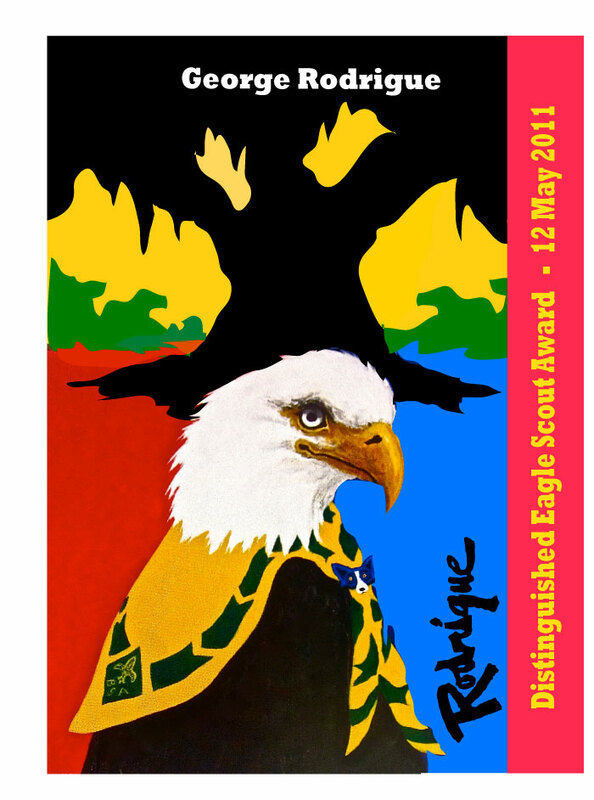 At the request of the Boy Scouts of America, George designed a unique patch based on his Eagle painting as a commemorative gift for the evening of May 12th. Afterwards the BSA adopts a special version for use nationally as an art badge for aspiring Eagle Scouts. 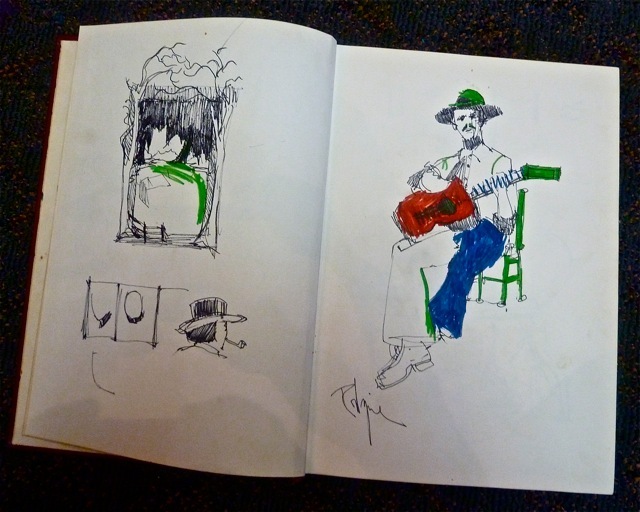 Last weekend we traveled through rural Alabama, retracing Hank Williams' childhood. I sought history for an upcoming blog post to coincide with Jazz Fest, but George is a long-time Hank Williams fan and longed to connect more personally with the country music legend, walking through his hometown and sitting on his front porch. We paused at a graveyard in Georgiana, Alabama. 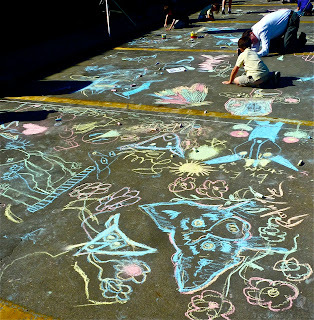 George took pictures from the air-conditioned car, as I wandered in the 97-degree heat near the back of the cemetery. Moody and distracted among the crumbling 19th century tombs and headstones, I contemplated the forgotten residents of a small southern town. "Come see," I called out to George, as I stared at a family's long-neglected plot. He snapped a photo of me just before he left the car, a black shape barely discernible in the grass to my right. George approached quietly, as I took pictures, unaware of the danger a mere eighteen inches from my sandaled feet. 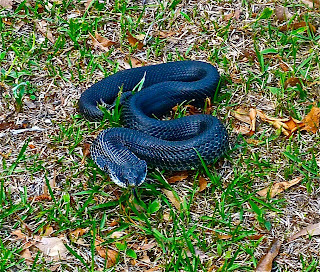 Without hesitating, he pulled me away just as a cottonmouth, coiled and reared back, prepared to strike. 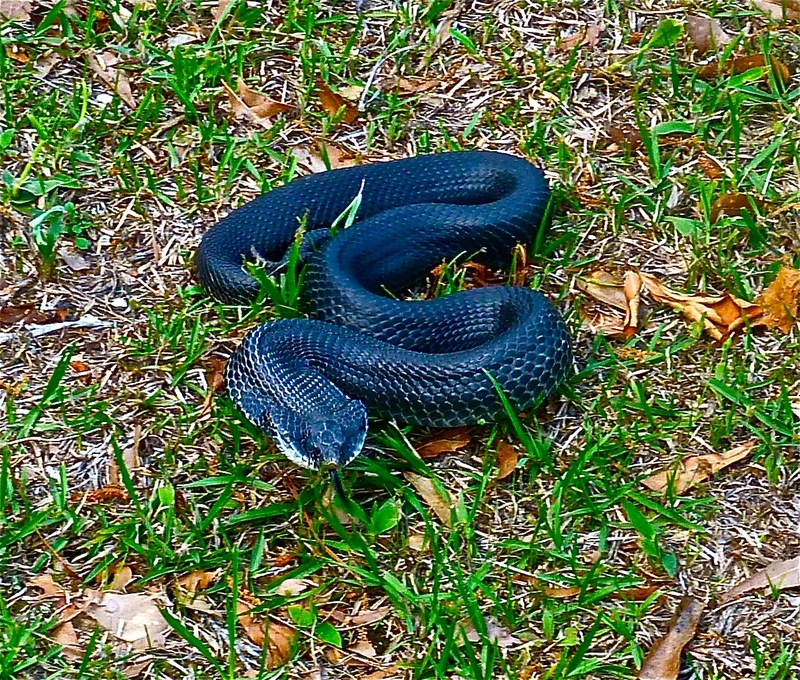 Had he called out to me instead, I probably would have jerked or frozen or otherwise enticed the snake with my fear. As I ran, shaking, back to the car, George grabbed the camera. "Nobody's gonna believe this!" he said. 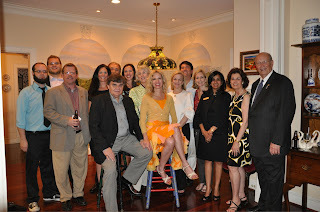 Hope to see you at this special May 12th event! Tickets and sponsorships start at $250, with all proceeds benefiting the thousands of young people and volunteers from the eleven parishes of the Southeast Louisiana Council, Boy Scouts of America. “Goodness,” I said, secretly hoping I could measure up. It wasn’t until months later, after he’d repeated this list a number of times for various reasons, that I learned it was the Boy Scout law, something he memorized nearly sixty years ago and has taken seriously ever since. 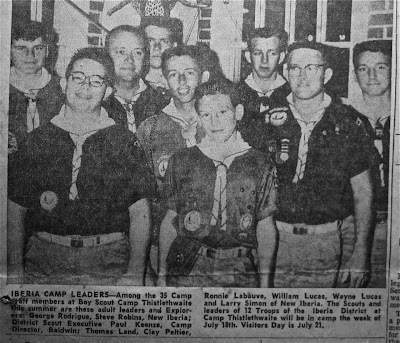 George’s older cousin Donald LaBauve was scoutmaster of Troop Number 136 in New Iberia, Louisiana, part of the Evangeline Area Council. George and Donald’s son Red spent every Monday evening throughout the 1950s working on their merit badges and planning for outings to Camp Thistlethwaite. 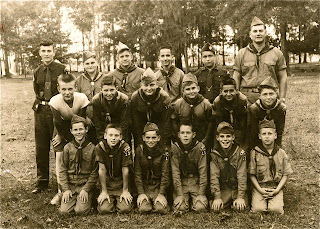 It was in Boy Scouts that George (pictured back row, second from left) first painted monsters, images so popular among his friends that he transferred them to t-shirts, selling them to earn money for gas. 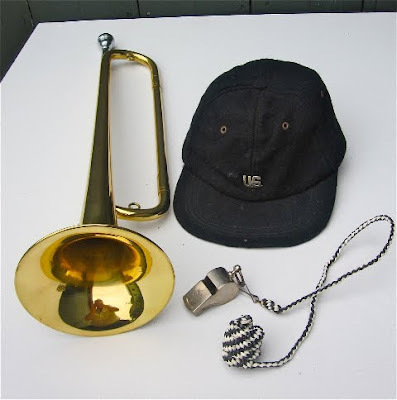 He also learned to play a musical instrument, the bugle, specifically to perform as the ‘echo’ for Taps during a special scouting event. He hid in the bushes and mimicked the older player, who stood in front of the troop and guests. 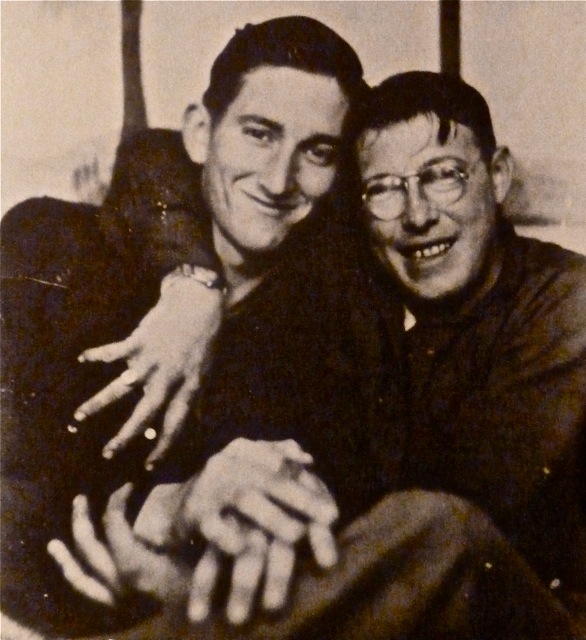 He recalls that when his fellow scout missed the high ‘G,’ George echoed the note perfectly from the shadows, thereby securing his promotion as head bugler going forward. 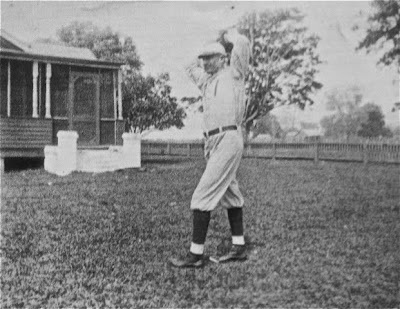 He played baseball as a Boy Scout, following in his father’s footsteps, a minor league pitcher (Big George, pictured below, in New Iberia). 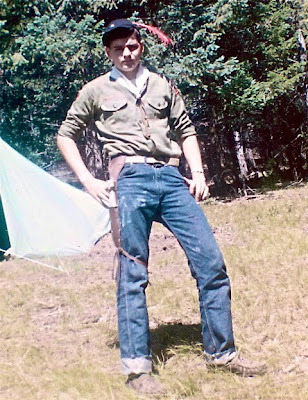 Equally rewarding was the year George won a full scholarship to Philmont Scout Ranch in Cimarron, New Mexico. 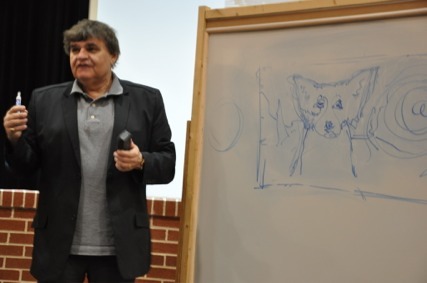 It was at the National Junior Leader Training Camp that he learned the skills, specifically the ability to teach younger scouts, that eventually earned him the prestigious rank of Eagle Scout. It was difficult for me to understand at first George’s pride at this achievement. 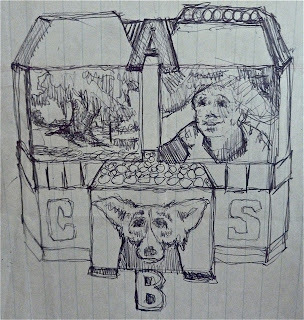 I was a Girl Scout and earned badges by playing the harmonica, selling cookies door-to-door, and plaster-casting squirrel tracks. 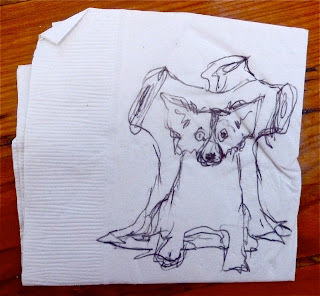 I spent a week or more each summer in a tent or cabin somewhere in the north Florida woods, cooking over the fire and stringing our food high in the tree, lest the bears get to it. Scouting was a wonderful part of my childhood, but by the sixth grade I didn’t care anymore, and today I’d be hard-pressed to put my hands on my sash; and the harmonica went to Goodwill years ago. 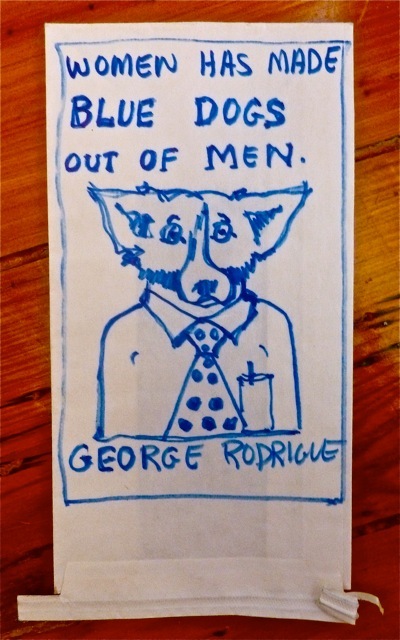 Yet within the curio cabinets of George Rodrigue’s studio, carefully placed among the numerous awards and keys to cities and photographs with presidents, are his merit badge, his bugle, and his Eagle Scout pin. 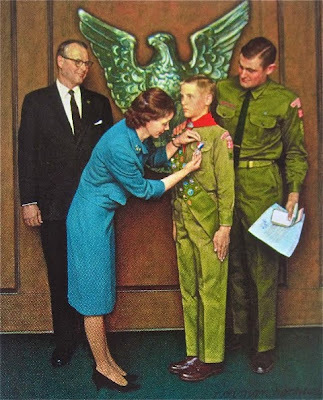 But in 1960, sixteen-year old George, home sick with the mumps, missed the Eagle Scout presentation. His cousin Red stood in for him at the courthouse and afterwards the entire troop visited George at home and pinned his pajamas. In 2004 the Boy Scouts of America asked George to commemorate his experience with a painting. They specifically requested the Blue Dog; however George, as with his Jazz Fest posters of 1995, 1996, and 2000, wondered at its relevance. 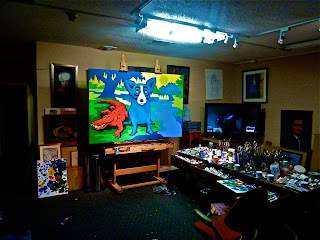 In the end, he focused on the American bald eagle as the painting's subject and incorporated the Blue Dog as a neckerchief slide. 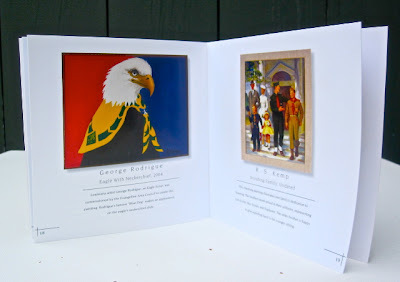 George was honored by this painting commission not only because of his past, but also because he joins the great tradition of artist Norman Rockwell and his Boy Scout paintings. Selections from the Boy Scouts' collection, including Rodrigue's Eagle and Rockwell's Pinning (pictured below), tour U.S. museums. 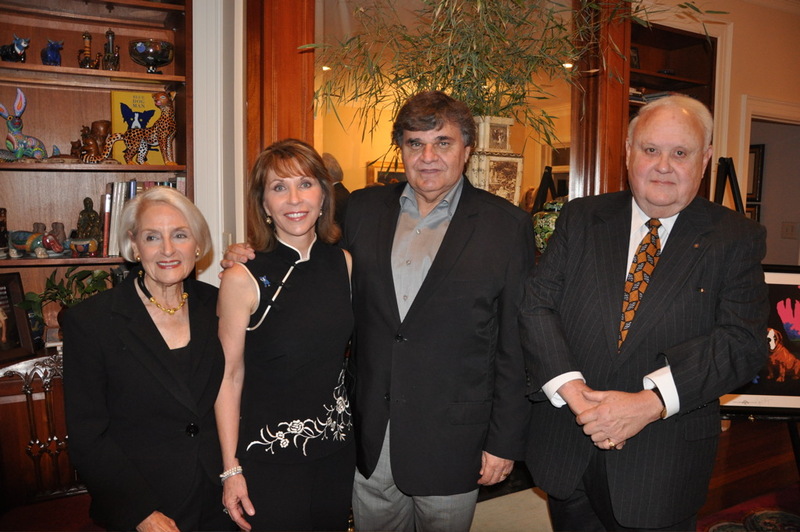 We attended one such special exhibition, on view during 2008 in the Great Hall of the New Orleans Museum of Art. 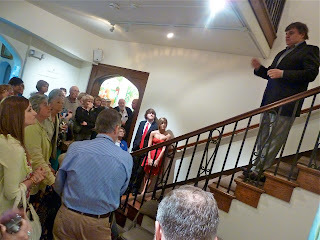 Today, when not on tour, George’s painting remains on view with the Rockwells and other fine original works at the National Scouting Museum in Irving, Texas. 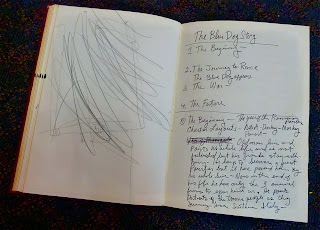 Finally, I’m reminded of a story George often recounts as pivotal. 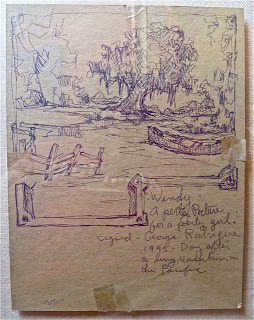 It was his last summer at Camp Thistlethwaite near Opelousas, Louisiana, where he worked in the general store. It was a personal and symbolic pledge, for better or worse, which he kept. 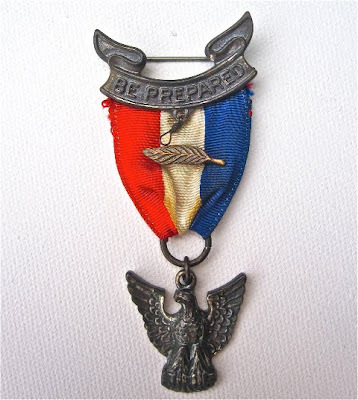 It was scouting that gave George independence, confidence, and pride. 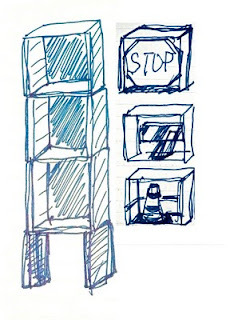 Sometimes I think even today that he approaches a project as though it results in a merit badge. 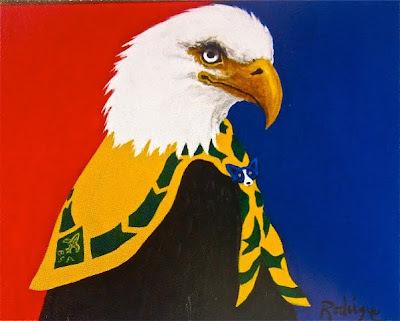 Although it appears on the outside that he moved on after high school, inside George remains ‘trustworthy, loyal, helpful, friendly, courteous, kind, obedient, cheerful, thrifty, brave, clean, and reverent.’ He remains, always, an Eagle Scout. I titled this post and immediately laughed, because it reminded me of “The Reunion,” “The Body,” “The Therapist,” or any number of episode titles from “Matlock,” my latest mindless television escape. It was in 1960 that Coach Raymond Blanco, husband of former Louisiana Governor Kathleen Babineaux Blanco, famously threw George Rodrigue out of class for drawing. He sat in detention in the hallway of Catholic High in New Iberia, Louisiana and, rather than repeat the assigned lines, continued sketching, already with the knowledge that he was far more artistically than academically inclined. Today he piles his old sketchbooks to the ceiling, all shapes and sizes stored in his warehouse, studios, and even his closet, a new one always on his desk. 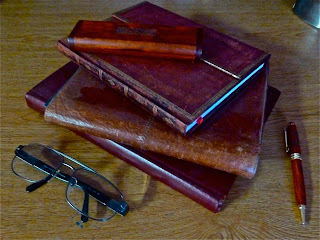 Some are leather-bound and small for his pocket, while others are 36-inches, made of tracing paper, and protected in portfolio cases. 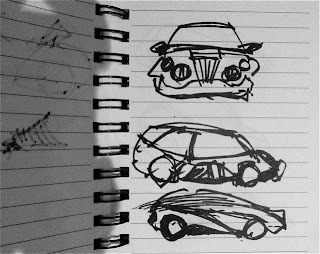 Within the pages he designs cars, houses, billboards, and statuary; writes books, movies, and poetry; and draws everything from sketches for paintings to mindless doodles. 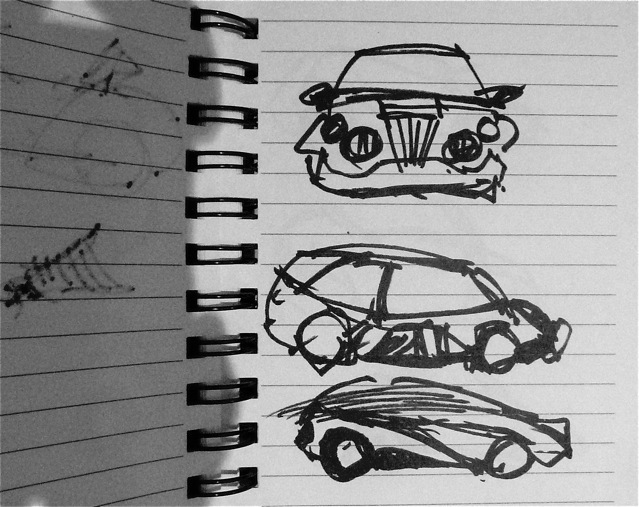 Without a sketchbook, George grabs any surface available, obsessed with graphically expressing his ideas. 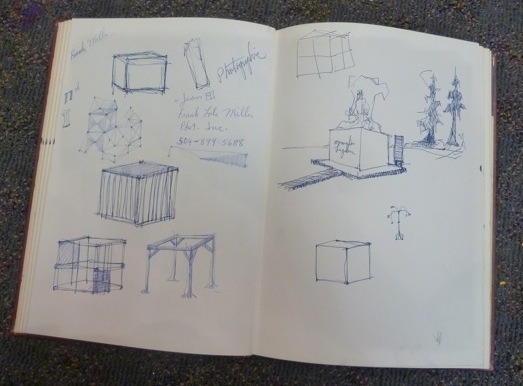 At the time, he speaks of these concepts as though they are the most important projects of his life, whether he's on an airplane, at a restaurant, or in the shower. 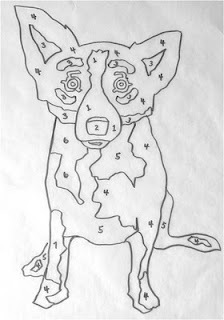 I awoke in the night one time and found him on the floor of our bedroom with a flashlight, the underside of a roll of wrapping paper spread out before him. 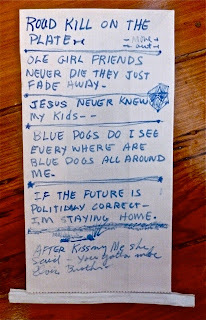 Another time, he found inspiration as I left the house for an Aerosmith concert (related post here). 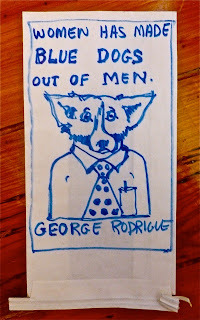 While on book tour for Blue Dog Man in 1999, George improvised on a long flight when he found himself without his sketchbook. 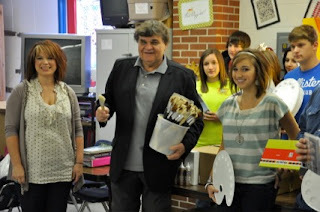 As I recall, he was inspired by Lewis Grizzard (1946-1994), author of such books as They Tore Out My Heart and Stomped that Sucker Flat (1982) and Elvis is Dead and I Don’t Feel So Good Myself (1984). 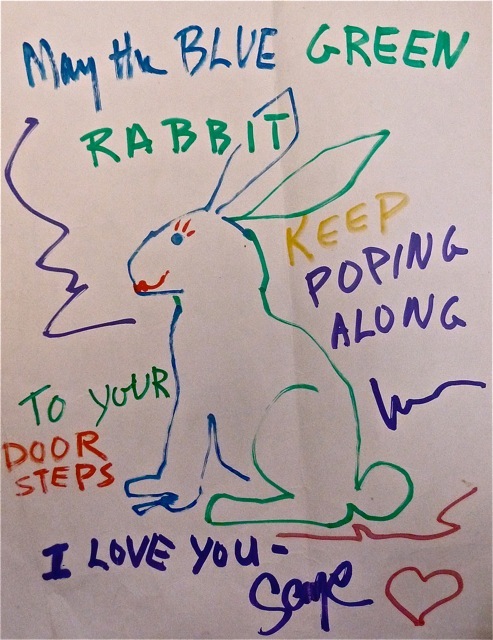 As we flew home from a Hawaiian vacation, I recounted our trip in letters to friends and family while George drew on the back of the stationary box. 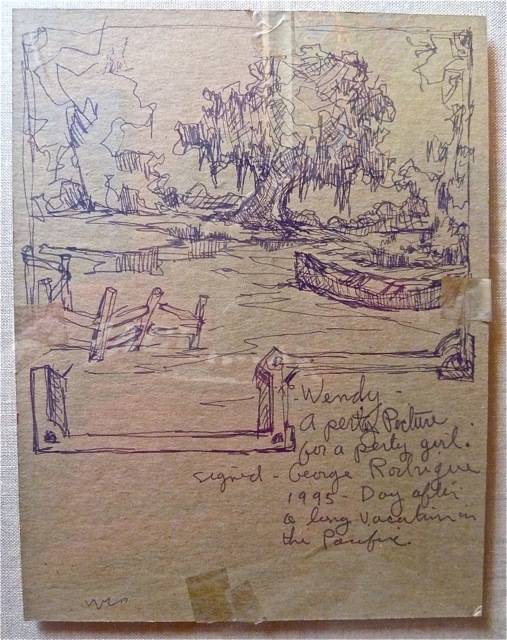 Instead of the beach, he drew his landscape, the bayous and oak trees of south Louisiana, with a pirogue waiting. Without a sketchbook, George absconds random surfaces, even if it means the drawings might be damaged, stolen or discarded. I was as happy as if Robert Browning himself had composed a love poem in my honor when, while installing a Rodrigue exhibition in Frankfurt, Germany, I received a package covered in doodles. Tablecloths and napkins are George’s favorite sketchbook substitutes. 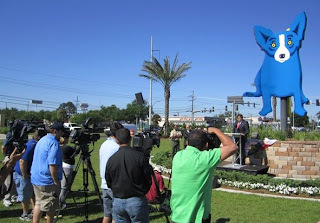 It was on a cocktail napkin that he designed the large-scale painted metal Blue Dog sculptures, such as the one in the Besthoff Sculpture Garden at the New Orleans Museum of Art and on Veterans Memorial Boulevard in Metairie, Louisiana. His preliminary design included an oak tree, similar to his bronzes of the mid-1970s. 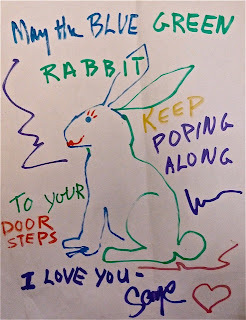 In our home, I frame George’s restaurant drawings, complete with tomato sauce and coffee stains, and intersperse them with my mother’s paintings and hand-made cards, all priceless memories hanging in my office. 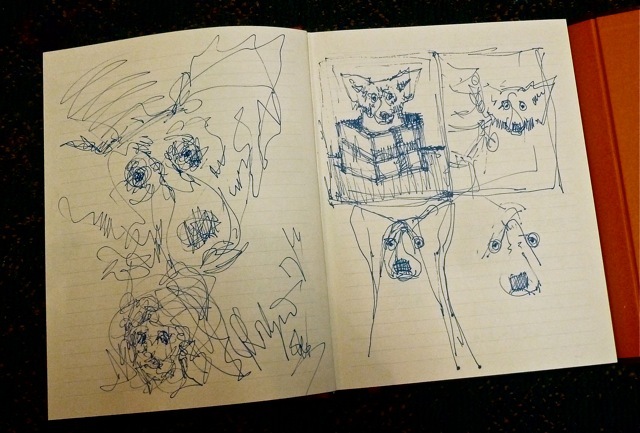 Yet the impromptu sketches remain my favorites, and apparently I’m not alone. 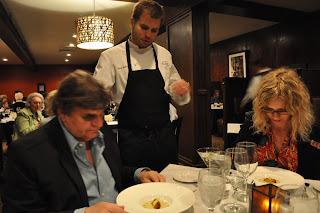 George doodled twice on French baguettes at the classic New Orleans restaurant, Galatoire’s. He drew the first in 2001 as a gift for David Gooch, the restaurant’s long-time manager. 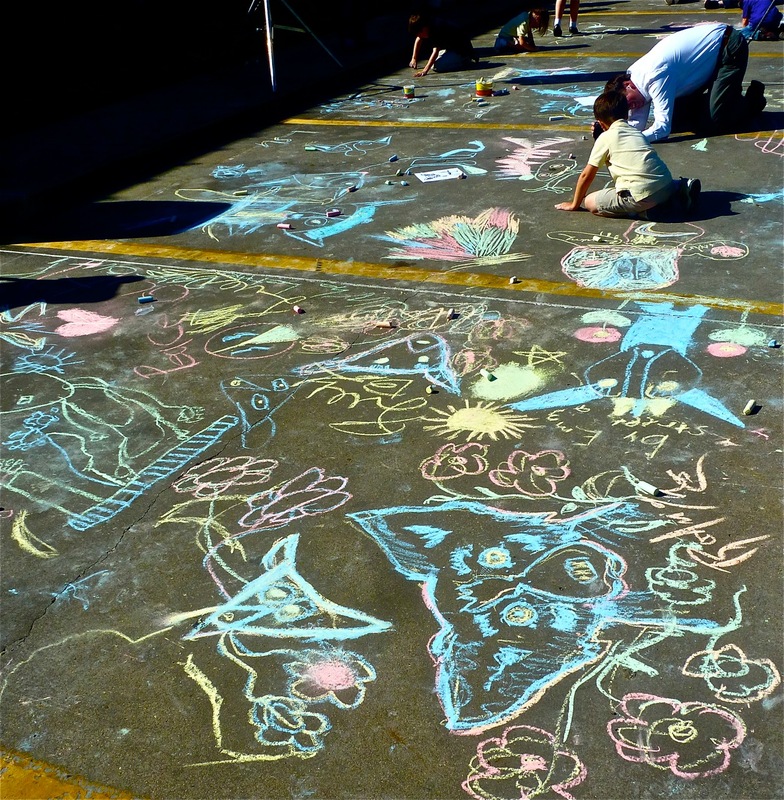 He drew the second after a food fight in 2005 resulted in the irreparable damage visible in the photograph above (I kid you not). 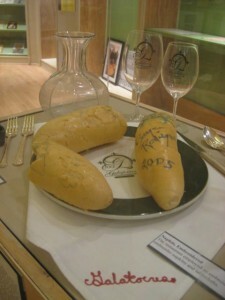 Mr. Gooch stored the bread on a pillow and carefully shellacked the unusual artwork for years, now on permanent display in the Southern Food and Beverage Museum. No doubt, Coach Blanco would be proud.